I can only presume that my mailman just sighs and shakes his head every time he has to put something in my mailbox. EDIT: Update at end of this post! 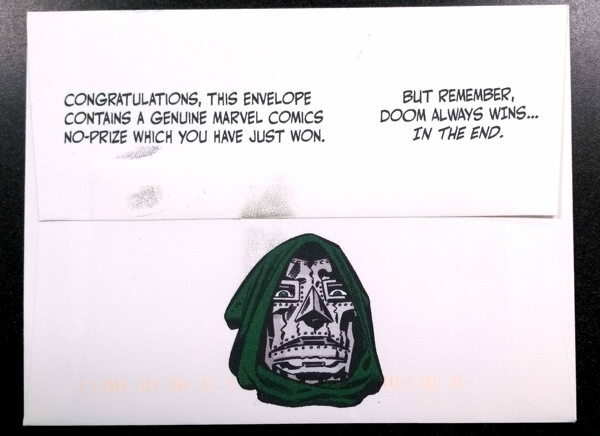 …what appears to be a genuine Marvel No-Prize (which is, for those of you who don’t know, the long-running “award” of sorts sent out by Marvel to the fans for various reasons, and is always comprised of an empty envelope). 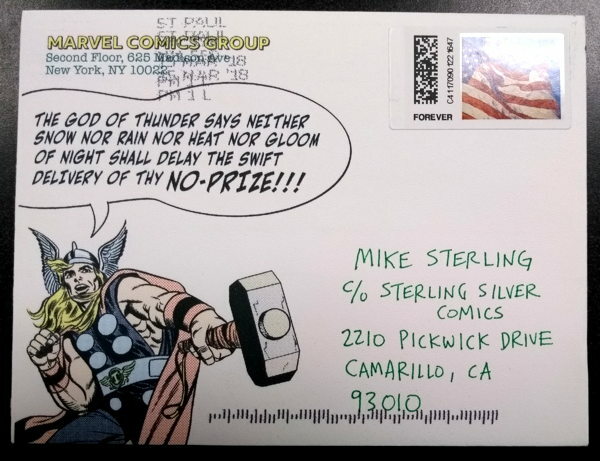 I’m pretty sure this wasn’t sent by Marvel, as that looks like my old friend (and former coworker) Rob’s writing on the front of the envelope there, so the full story of this particular item is yet in my future. I once had what I thought was a surefire way of getting an actual from-Marvel No-Prize for myself a few decades back, in the 1980s, when it seemed like No-Prizes were just given out willy-nilly. Sometimes No-Prizes were given out for coming up with some clever explanation for what appeared to be an in-story mistake or some other kind of error. I found such an error in Marvel’s in-house “fanzine” Marvel Age , where an article was given the wrong page number on the table of contents. Turning to that page actually brought you to a picture of Doctor Doom, and I had some kind of elaborate and “funny” and possibly No-Prize-worthy idea that this was in fact a cunning ruse by ol’ Vic Von, to trick people into gazing upon his visage and falling under his thrall, instead of finding a sneak peek of Wolfpack or whatever that article was in the TOC. Anyway, never mailed it in, so I lost my chance at my non-reward…but I guess getting this in the mail makes up for it. Thanks, anonymous benefactor who is probably Rob! EDIT 3/23/18: Okay, it wasn’t Rob, but another friend who mocked up a No-Prize envelope and mailed it to me. That sneaky guy! I always wanted a No Prize. I guess in some way I have many. If all you’re going to get is the envelope, at least it’s an amazing one. OK, this is weird. (But a fun weird. It kinda made my day.) I just got one of these in the mail also, sent to my home address, written in the same green ink and same handwriting or font. Mine doesn’t have Dr. Doom on the back of the envelope but otherwise it’s the same. I have no idea why I got one. Viral marketing for the Avengers movie, maybe? It’s not your fault that you didn’t mail it in. I blame Richards…RICHARDS!